In the public media, universities are often targets of anti-intellectual rants; but criticism of universities often comes from people who are not familiar with the complexity of university cultures. We thought that as anthropologists, we should be able to capture and communicate that complexity by writing an ethnography. Underlying this intention was a concern that neither national surveys, nor Maclean’s ranking of Canadian universities, nor public relations branding campaigns could capture the essence of York culture or counter anti-York writing in the media. 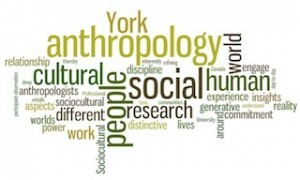 York was not well served by these approaches, and we thought that an ethnography might do better. 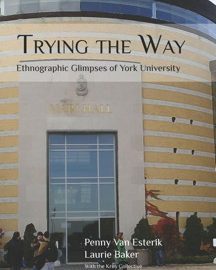 The product of this project is the book “Trying the Way.” This book was meant to complement the history produced to celebrate the 50th anniversary of York in 2009 (Horn 2009). It is available as a free download here. Trying the Way emerged from a fourth year seminar course in anthropology called Practicing Ethnography, where class members learned ethnographic practice by observing their campus. An ethnography is a written description and analysis of a community in a particular time and place, as observed by one or more ethnographers, with a goal of communicating about that community to others. Ideally an ethnography is based on long term engagement with the community in question. The first hand experiences and observations of ethnographers, often in the form of fieldnotes, are augmented by additional contextual materials. Some of those class members remained involved after the course ended and became members of the Kroy (“York” spelled backwards) Collective. The project expanded organically with observations and feedback from a number of student and faculty members in the York community. It took shape in the year before York’s 50th anniversary when some interesting soul-searching took place, particularly among older retired faculty members. To our knowledge, this is the first ethnography of a Canadian university. It is not the definitive ethnography of York; it is simply the first of a possible set of ethnographies of York University. More ethnographies need to be written from other entry points. Ethnographies are always partial, always selective, and they carry the biases of their observers with them. Prof. Penny Van Esterik conceived of the project, developed a course, Practicing Ethnography, to test out the idea, and did much of the initial writing. When the 50th anniversary committee agreed to fund a GA, Laurie Baker came on board and remained long after the funding ran out, writing, reviewing, editing and overseeing the technical side of document production. We use a plural voice throughout, except when we add our initials to footnotes to indicate our personal experiences. The Kroy Collective is a group of students who contributed substantially to the research and came to workshops/meetings to brainstorm about the ethnography. The collective members acted as a focus group, bringing observations and questions to workshop-like settings, and exchanging information. Some members provided written reflections about an event; others critiqued outlines and early drafts of written pieces. Collective members attended open meetings on campus life, planning exercises, and political protests.